Recently an old friend found me on facebook. The last time I had seen her was when I was a teenager. It had been around 16 years. All went well with small talk until a few nights ago. 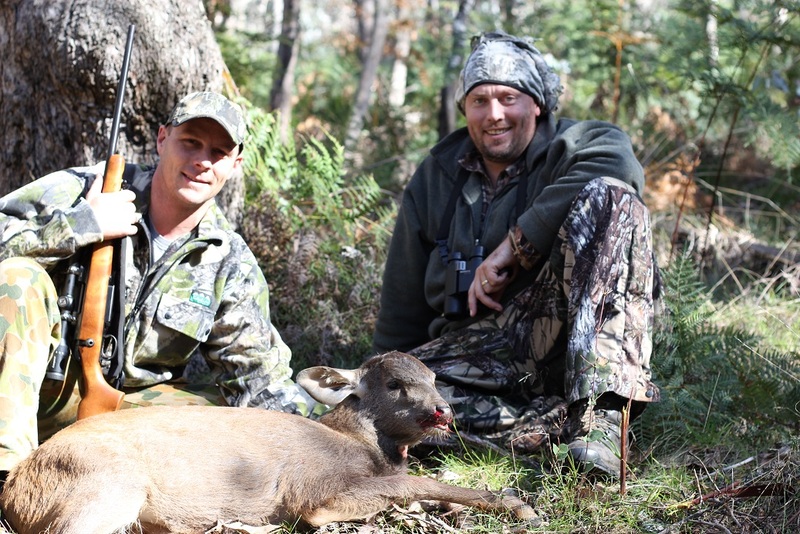 I had been on a successful trip chasing sambar deer in the state of Victoria. A friend had tagged me in a couple of photos. One of which had me sitting behind a deer with a friend. It was his first and he was understandably thrilled not only on his achievment but the meals that would follow. Another friend called up asking me who the abusive person was on my profile and on his photos calling me all manner of names. I arrived home and logged on to have a look. There she was hurling abuse at me, my friends and for some reason my father apparently for being responsible for my birth. She was using very powerful language and expletives which usually wouldn’t rattle me, but because I knew her personally it did. Her opinion was coming from someone who obviously knew little about how I hunt or hunting in general. She admitted she ate meat and used animal products. Her understanding of animals was likened to human behaviour and emotions. I tried to reason with her and explain my reasons privately but was banned from her profile before I had a chance. My father did the same but was promptly cut off as well. I want to explain for anyone reading this page the reasons why I and most people I know hunt. From a young age I have been fascinated with animals. I collected any I could find and catch as a young fella. I climbed trees and lifted up rocks. I waded in the mangroves and clambered around cliffs. I read books on birds, mammals, fish, insects, plants and anything I could get my hands on. I kept pets of many varied types from reptiles to axolotls. I bred birds and fish. Unfortunately death and understanding it, is a part of these hobbies. As I grew I realised some animals can be pests. We have foxes and cats in Australia wreaking havoc on our wildlife. We have pigs destroying farmers crops as if drought and flood aren’t enough to contend with. We have camels trampling our sensitive desert areas. Any realist would have to understand we need to combat these pests. To let them multiply unhindered will see much damage occur to the environment. I still love all animals. Watching them native or non native is special. From small birds going about their business building a nest to two big buck kangaroos fighting for dominance. Its all a part of nature’s tapestry as is death. Professionals conduct culls in areas that have big populations of pests. It is a shame to me to see the meat left to rot on the ground and not being utilised. The main reason for me starting to hunt with a rifle or bow was for the table. With the cost of living in Australia going through the roof why not fill the freezer whilst spending time with nature. I could only see positives. My family now eats beautiful free range meat. These animals have never felt borders, have lived a life doing what they want to do and eat what they want to eat. They’re never trucked to an abbotoir or contained in a feedlot. They’re never placed on a conveyer waiting for a bolt to the brain. I know where each animal has come from and I know how it was treated from the moment I took responsibility for its life. That is like precious gold. Obviously not all animals can be consumed. Animals like foxes and cats are strictly off the menu. Pigs full of parasites are not coming home with me either. A look at the stomach contents of a cat or fox confirms that I am doing the land a favour though. They are full of our native lizards, mammals, birds, and insects. Its not a task everyone can do but it is a necessary one. The hunting instinct is alive and well in humans. Something that will never change. Many think we have evolved beyond it. Its not true. In some it lies dormant but it is there. Our ancestors would never have survived cold harsh winters without the consumption of other animals. My Scottish ancestors on one side hunted to survive and on the other side my Polynesian ancestors did the same. Why is it ok for Aboriginals in Australia to hunt and not me? What makes us different? We are both human and both have the same instincts. Why is it acceptable for them only? Are they telling me I am more evolved than my native brothers? People also ask me why I have my photos with the animal whilst smiling? Why do I put the deer’s head on my wall? For me its about respect and memories. The animal is remembered in reverence in the photo. It could represent a hard slog in some unhospitable terrain with a mate or a long drawn out stalk on a wily old hind. The smile is one of fulfilment of a cleanly taken animal and the realisation I’ll be carrying the meat a long way back to camp. Its not about me standing over an animal in an act of dominance and bloodlust. Why the head on the wall? Not only do I eat his meat but my connection to the animal continues by being placed in a spot I can still look at, admire and remember it. A glance at him brings back a flood of memories for me. My ancestors also practiced this behaviour. If that’s not respect and reverence please tell me what is. I find it a shame in our modern age children and many adults have no connection to the land or animals. The closest they get is getting their milk from a container in the fridge or their meat sliced up on a foam tray complete with absorbent mat to soak up any unsightly blood. They have no idea of the processes involved to get that animal or product from the farm to the shop and into their fridge. The last time most people even think of that animal is when they press the flush button on the toilet. You tell me who respects their food more. Thanks for reading. I hope I have explained my reasons clearly and have given you some food for thought. Please comment if you want to as I welcome healthy debate. So true mate, that chick had me thinking for days. Not out of anger but why we are so misunderstood and you hit the nail on the head with that article. There are numerous reasons and bloodlust isn’t one of them. I am lucky to not have had such a reaction, either on Facebook or WordPress. The worst was a couple people who thought the pictures were gruesome, but not objectionable. Point taken- no more photos of whitetails with 12ga slug holes or limp, dead geese on my Facebook. If I had someone flip out like that, I would give them a simple, brief “Mind your business”. Where I live, deer are hunted to keep the population in check. Without natural predators like wolves and bear (though those are definitely bouncing back about 200 miles north of us), many deer would starve over winter, and even with hunters, many are forced to move across roads to find food, and are struck and killed. To me, hunting is a bit of attempting to right a wrong- in the American Midwest, we stupidly killed off and pushed out predators. At one point, we also over hunted deer, but once they bounced back, there were too many of them. And considering we farm food sources for them at prodigious rates, we’re cleaning up our own mess. It’s also about food, but that’s a given. Thanks for the reply Amber. Unfortunately the anti hunting brigade in Australia gets a lot of airtime from the media. They are given free kick after free kick. Law abiding shooters and hunters are lumped in with illegal firearm use. It mostly comes from our cities. People with little idea of life away from concrete, cafes and high rise. Pages like Gourmet Hunters are really trying to show the benefits of getting out there. i have a mate who is in racing and has shot once many years ago who is a bit anti and has started many heated debates with me over some of my posts on gun control and hunting on facebook. had him over last night for a bbq and had a good discussion with him and he had a look at my storage and rifles and how i handle them and realised the care and self discipline i have with them. may even come shooting at the range with me one day soon and for the most part he is very anti gun culture yet he saw the responsible side of it and realised that for me to ever use one on another person it would be a case of them or me dying or that of someone else less able to defend themselves. have always been harsh on safety first with firearms as it is way to easy for a mistake to be your last if you do screw up however if you follow a few basic rules it is one of the safest sports around. That state of not having enough connection with nature draw some people to end up with poor cross examination asumptions. Specially in the hunting area, where the difficulty to establish the relationship between human emotions towards animals exist. But rather, i found it really fascinating the way you recall your fascinating interest towards animals from your younger age, as well as a hunter today. The style in this article is very captivating which makes it really clear to understand both the language and the tone. Hunting is an extraordinary activity and should not be perceived as aweful as some people tend to see it. Mate you doing a good job, keep on doing your job and feed your family as much as you can because the cost of living is sky-rocketing everywhere even here in states and hunting would help you save some money for other purposes. I hope you’re well over there. You come from a country where hunting is a normal part of life. Africa seems a lot more at ease with hunting than some other countries. We are fortunate to be able to hunt here in South Africa! BUT we are not exempt from the couch potato critics and bunny huggers. I process and utilise everything I hunt. Venison is good healthy meat. Good article – any activity (hunting, fishing, hiking, camera-ing) is a good reason to get in to the outdoors. The pull of the trigger is such a small portion of the nature experience! Haven’t had a confrontation yet. Perhaps my circle of friends is too small 🙂 I agree with all you wrote and would add to your arguments in favor of hunting, that it is fun. No sense hiding from our genetic predisposition to it, just like a cat chases yarn, we were born to hunt. I completely agree. I think where people get it wrong is they think the fun comes from the actual point of the kill. They think we have bloodlust and take pleasure in ending the animals life. A reverend on our radio here accused hunters of getting a sexual thrill from killing. Where do these people come from?. I have never met a hunter in my life that takes pleasure in harming animals. If I did I wouldn’t be hunting with them as I would probably feel a bit nervous. There is a mixture of emotions that run through me when I actually take an animal. Its hard to explain but elation and sorrow seem to be present. We love the animals we kill, strange but true. Compare our hunting with the guy eating a cheeseburger 1) we do all the butchering and preparing the meat, usually wasting very little. 2) We give the Trophy Parts (horns, fur, etc.) an honored place in our homes and photo albums. 3) most of us are genuinely upset when we fail to cleanly kill our quarry 4) after the last meal is had, there is a remote sadness in the finality of our relationship with that particular animal. It’s not love in the same respect as spousal, parental or platonic; it’s a love nonetheless. yes very much agree. sure there is a certain elation derived from a clean kill but also a sadness as well. the elation is not from the kill itself but rather from the fact that you have achieved it as cleanly and humanely as possible rather than causing suffering. most of us as Andy talks about give it pride of place in our lives by not wasting any of it (me including the bones which i use to make stock for soups and stews) and all the meat. the skins i turn into rugs or other leather goods. have not had a deer or anything that i wanted to mount a head yet but maybe in time. Right on Andy! Common sense straight from the Heart! Thanks for the support Rick. Thanks for the support Jason. I guess getting away from it all is another benefit of getting out there. Alone in a gully looking at deer rubs or just watching nature in general can give you a lot of thinking time. We all need solitude at times. Andy send her a copy of “Hymn for a Wounded Man” by Stephanie Dale. And you could also find the podcast of a interview with her by Richard Fiddler on ABC Conversations. I think you will find it a refreshing view from a vegan feminist. Your ex school friend will be shocked to her core. I agree that if it’s safe and humane, then hunting is no worse than buying a burger (perhaps in some ways environmentally better) but I think it is often difficult to be sure that it is safe (especially in National Parks) and that it is humane (when it is so easy to get a gun licence). I also find it very hard to relate to loving an animal and then killing it (and yes, I’m a vegetarian so don’t bother saying that eating a steak is the same. I know). I have spent four years studying biology and a lifetime bushwalking, which I find brings me much closer to animals, without needing to kill them. Also, recreational shooters do very little to reduce the numbers of feral animals (in Australia at least). They are actually often accused of introducing (or spreading) more or targeting only males or whatever else to keep the populations up. I know this isn’t everyone, I am just saying that recreational shooting is not a solution to feral animal management. However, it is really reassuring to know that some (and hopefully lots!) of hunters are ethical and mindful of their impacts. They respect their animals and treat them well. Thank you for giving me an insight. I’m certainly not pro-hunting, but it is always good to hear different perspectives. I hope you understand mine. I’ve often heard the claims that recreational hunting is not effective in the control of feral animal populations. Often the doomed surplus is cited, but from my very limited reading – and I’d be interested to hear your thoughts as someone who studied biology and who has, I’d imagine, a far greater depth of knowledge on the subject – this theory is often violated and in fact is a theory that supports sustainable hunting of native populations ie a duck season in NSW or kangaroos (both of which are wonderful sources of protein). In my own experience I’ve seen evidence of enormous population declines in feral goat populations in a State Forest that my father and I frequented. I would be very interested to read anything that counters these observations – so far they have been lacking. And maybe I’m not anti-hunting either. Just make sure it is totally safe, humane and that nothing is wasted. Thanks. Thanks for this, I much appreciate your response to your friend`s outburst. My husband and sons enjoy hunting with their cousins and friends alike. As I live in a regional area I find myself having to explain their love of the wild! I`m actually over, mentioning it at all now as there is too much negativity. It is a pity but in any group there are crazy individuals and micro groups within a macro that give the majority a bad name. Thank you again for your words! I agree wholeheartedly! Thanks, I enjoyed reading your story. I grew up on a cattle property and used a rifle and did .22 target shooting, then I moved to the city and now live close to the coast, where the main gun culture people see is on the wrong side of the law. It’s funny how much you get used to the city-centric way of thinking even when you have a bush background, so I can only imagine how hard it would be for a city born and bred person to even remotely understand the journey from live animal to steak on the BBQ or even worse the inner city dwellers that rarely if at all cook any of their own food. I recently went to Cunnamulla, Qld and actually found myself a bit disgusted by the seeming obsession for pig hunting. I even almost found myself telling my kids that there was something wrong with these people for loving to kill animals for “fun”. Then I found myself having a bit of a debate with myself (in my head, not out loud) about the need to control pest species and realised that I had been disconnected with some of the realities of rural life. Funny up until that time I had prided myself on teaching our kids about where different meats come from and that it isn’t cruel to grow animals for food but it is cruel to make animals suffer like caged chickens that we are guilty of eating anyway. I have discussed with them how cattle are killed so we can eat them and we have chickens for eggs and all that stuff. So thanks again, you have put this into words beautifully and I promise to teach my kids about hunting and why people do it, and I will be using your blog for some of it. P.S. Your story also got me thinking about how we treat fish differently than mammals. Just look at all the popular fishing shows on TV, but I notice they don’t actually show them killing the fish, just show the releases or cooking the fish afterwards or eating it at after someone else has butchered it and cooked it. Funny old world we live in. Very well written article, I wish I had your composure. What bothers me the most is that the greatest opposition comes from nature lovers. I pray to mother earth every morning and ask her every evening to send her gifts and wake me with dawn’s first light. I suppose it is just another one of Her ironies that pits the “other” nature lovers against us hunters. Hunters are regularly made aware of these ironies and know that it is not only the Her humor but also a sign to pay attention to. We are patient because it is a trait we have developed through hunting, and our awareness never waivers while we wait. This entry was posted on June 27, 2013 by gourmetandy in Interesting bits and bobs and tagged Ancestor, Animal, Animal product, environment, feral, gourmet, humane, hunt, hunter, hunters, hunting, meat, pest, sustainability, welfare.